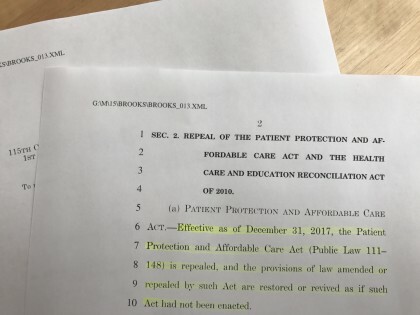 The federal healthcare law established by “the Patient Protection and Affordable Care Act” – or, Obamacare – is unconstitutional and must be repealed. But while Congressional conservatives and the Trump Administration look to erase Obamacare's worst elements, we must demand that they not stop short. It's time to urge members of the House and Senate to fully dismantle the healthcare law -- that every last word of Obama's signature legislation be erased from the books. Right now, we must urge legislators to support and pass the two-page "ObamaCare Repeal Act" which fully repeals Obamacare and replaces it with nothing. Take Action! Sign the petition and tell legislators to FULLY REPEAL Obamacare by passing The ObamaCare Repeal Act in 2017! Read The ObamaCare Repeal Act here. terry p. from Defiance, OH signed. Meagan S. from Phoenix, AZ signed. Meagan S. from Inglewood, CA signed. Kirsten S. from Longwood, FL signed. I do not want the government involved in my healthcare. Repel, do not replace Obamacare. Also, when reading the bill, there are too many loopholes, subsidies, and other items, that most Americans are unaware of. These do benefit Americans, but few with deep pockets and whose interest is gained. John B. from West Palm Beach, FL signed. PLEASE GET THOSE TRYING TO KEEP OBAMACARE (dumb Democrats and Speaker Paul Ryan) REMEMBER WHEN CRAZY PELOSE SAID YOU HAVE TO PASS IT TO FIND WHAT'S IN IT!!!!!!!! FULLY DISMANTLE IT & GET A SHORT, PRECISE, & SMART WRITTEN REPLACEMENT AND GET IT PASSED ASAP. yOU MUST HAVE SOMEONE SMARTER THAN PAUL RYAN. HE SCREWED THE FIRST VERSION get someone who is hugely smarter than PAUL RYAN crazy PELOSI TO GET A WHOLE NEW HEALTH LAW WRITTEN. YOU MUST HAVE SOMEONE WHO HAS WORKED ON CREATING ONE; CHECK WITH GOVERNORS IN STATES WITH GREAT PLANS ALREADY DONE WITH BRAINS AND KEEP IT SHORT. Fred C. from Stephenville, TX signed. The government should not have the authority to control its citizens and take away their freedom of choice. We put members of congress there to get rid of this control. Please repeal this law in its entirety and make provisions for the market place and people's free choice to determine how health care will work. It's unfortunate that everyone can't have what they want at the expense of other people (redistribution), but it's not the government's place to provide it (redistribution). They can promote it, just not provide it. Choices will have to be made and personal responsibility with play a major role, but as a free people it's our choice. It's not the government's job to force it on us or step in and become the nanny state. The ONLY Constitutional justification for a government run health system is the "General Welfare" clause. This clause states that the government will "promote the general welfare." That phrase in the preamble of the Constitution is used to justify a fully government controlled medical system. Is that promoting the general welfare? Mr. Dobbs are you and other citizens cognizant of the elephant (Modern-Day-Aristocracy) in the room? The elephant represents the metastasizing cancerous growth of a Modern-Day-Aristocracy in the midst of our central, state and local governments. Hide original message The current political choice is either to return the medical community to sanity "Market-Based-Precepts" or continue muddling through the convoluted contraption of nonsensical bureaucratic idiocy called Obamacare! Most sane folks would proclaim the following, "replace Obamacare with Market-Based medical care precepts common in the USA before LBJ." Medical care was affordable or market controlled in the early 1960's. Why? Because, in the early 60's and previously, nearly every family or individual paid cash for their medical care. Why? There were very few reasons to even consider possessing a medical insurance policy previous to the 1960's, because most every medical procedure and drug was affordable. THE THREE FORMS OF ARISTOCRACY IN AMERICA: (1) THE NOBILITY'S MEDICAL CARE SYSTEM or the most self aggrandizing medical-insurance-coverage available in America since the 1960's. The Nobility's or government employee's (bureaucrat or elected officials) medical-insurance-coverage's is the prerogative of status within America's Aristocratic Society. The Nobility or government employee receives 100% of their wages and benefits from the government's general fund. The Nobility's or government employee's April 15 paper work submitted as taxes paid is, in reality, just a negotiation over their net take home money's. Nothing was or has ever been contributed to the general fund by the Nobility class or government employee, be they city, county, state or federal employee. (2) THE VASSAL'S MEDICAL CARE SYSTEM or the second most self aggrandizing medical-insurance-coverage available in America since the 1960's. Mysteriously, first class medical insurance coverage's are economically affordable or available to employee's of large businesses or corporations (the Vassals). Probably due to scale, size or whose-bread-got-buttered by special deals in Congress (the Nobility), these same loop-holes seemingly are not available to smaller enterprises or individuals (the Subjects). I am quite sure those loop-holes provided to large businesses and corporations and their employees (the Vassals) resulted in inflicting extra and unknown burdens upon the less-politically-connected family businesses and smaller scaled private enterprise employers and their employees (the Subjects). (3) THE SUBJECT'S MEDICAL CARE SYSTEM or those who ended-up-getting-screwed trying to achieve the goal of obtaining affordable healthcare. Who represents the most important and productive portions of the economic society in the USA? It is those hard working Subjects or independent individuals, family businesses, small scale entrepreneurs and their employees. SOLUTION: THE ELIMINATION OF AMERICAN ARISTOCRATIC POLICIES RELATING TO MEDICAL CARE! Return to "Market-Based-Medical-Care-Precepts" as fathomed in our constitutional system of free markets (capitalism). We fought the Revolutionary War to escape aristocratic precepts. For instance, no one should be allowed to obtain medical insurance or medical care from a third party, such as an employer, whether that employer be private enterprise or government. Instead, mandate that everyone possess their own private medical-care-savings-account with 5 % (or ?) taken out of their salary, commission, contract or whatever. There should be, absolutely, no mandate that anyone has any kind of health insurance coverage, nor regulations on who, what, where or the amount of insurance coverage. Nor, should government mandate a single payer or socialized or nationalized medical care systems upon its citizens. The majority of single folks will, by nature, have no medical insurance coverage. The non-insurance-policy-holder is the singular mechanism that could ever re-apply a market force between the provider and the patient in order to actively bargain for the most equitable price. The mere fact, that a majority of working people possess medical insurance coverage, via 3rd party, in 2017, has created a near zero market force, being applied, in the negotiation for an equitable price between provider and patient. If the majority of the citizens, did not possess, a 3rd party purchased medical insurance policy, then and only then, would market forces be asserted, resulting in an equitable price. Of course, within or under "Market Based Precepts" most families with children will have catastrophic or hospitalization insurance coverage. Under, "Market Based Precepts", practically no one will possess, the now most commonly held, comprehensive-medical-insurance-coverage because this type of coverage does not foster or encourage the application of market forces. Sincerely Yours, David Johnson, 178 County Road 892, Etowah, TN, 37331 ph 423 428 7953. I am 76 years old, spent much time in government employment, in nearly every portion of USA and in many private enterprise jobs. Mr. Dobbs are you and other citizens cognizant of the elephant (Modern-Day-Aristocracy) in the room? The elephant represents the metastasizing cancerous growth of a Modern-Day-Aristocracy in the midst of our central, state and local governments. Hide original message The current political choice is either to return the medical community to sanity "Market-Based-Precepts" or continue muddling through the convoluted contraption of nonsensical bureaucratic idiocy called Obamacare! Most sane folks would proclaim the following, "replace Obamacare with Market-Based medical care precepts common in the USA before LBJ." Medical care was affordable or market controlled in the early 1960's. Why? Because, in the early 60's and previously, nearly every family or individual paid cash for their medical care. Why? There were very few reasons to even consider possessing a medical insurance policy previous to the 1960's, because most every medical procedure and drug was affordable. THE THREE FORMS OF ARISTOCRACY IN AMERICA: (1) THE NOBILITY'S MEDICAL CARE SYSTEM or the most self aggrandizing medical-insurance-coverage available in America since the 1960's. The Nobility's or government employee's (bureaucrat or elected officials) medical-insurance-coverage's is the prerogative of status within America's Aristocratic Society. The Nobility or government employee receives 100% of their wages and benefits from the government's general fund. The Nobility's or government employee's April 15 paper work submitted as taxes paid is, in reality, just a negotiation over their net take home money's. Nothing was or has ever been contributed to the general fund by the Nobility class or government employee, be they city, county, state or federal employee. (2) THE VASSAL'S MEDICAL CARE SYSTEM or the second most self aggrandizing medical-insurance-coverage available in America since the 1960's. Mysteriously, first class medical insurance coverage's are economically affordable or available to employee's of large businesses or corporations (the Vassals). Probably due to scale, size or whose-bread-got-buttered by special deals in Congress (the Nobility), these same loop-holes seemingly are not available to smaller enterprises or individuals (the Subjects). I am quite sure those loop-holes provided to large businesses and corporations and their employees (the Vassals) resulted in inflicting extra and unknown burdens upon the less-politically-connected family businesses and smaller scaled private enterprise employers and their employees (the Subjects). (3) THE SUBJECT'S MEDICAL CARE SYSTEM or those who ended-up-getting-screwed trying to achieve the goal of obtaining affordable healthcare. Who represents the most important and productive portions of the economic society in the USA? It is those hard working Subjects or independent individuals, family businesses, small scale entrepreneurs and their employees. SOLUTION: THE ELIMINATION OF AMERICAN ARISTOCRATIC POLICIES RELATING TO MEDICAL CARE! Return to "Market-Based-Medical-Care-Precepts" as fathomed in our constitutional system of free markets (capitalism). We fought the Revolutionary War to escape aristocratic precepts. For instance, no one should be allowed to obtain medical insurance or medical care from a third party, such as an employer, whether that employer be private enterprise or government. Instead, mandate that everyone possess their own private medical-care-savings-account with 5 % (or ?) taken out of their salary, commission, contract or whatever. There should be, absolutely, no mandate that anyone has any kind of health insurance coverage, nor regulations on who, what, where or the amount of insurance coverage. Nor, should government mandate a single payer or socialized or nationalized medical care systems upon its citizens. The majority of single folks will, by nature, have no medical insurance coverage. The non-insurance-policy-holder is the singular mechanism that could ever re-apply a market force between the provider and the patient in order to actively bargain for the most equitable price. The mere fact, that a majority of working people possess medical insurance coverage, via 3rd party, in 2017, has created a near zero market force, being applied, in the negotiation for an equitable price between provider and patient. If the majority of the citizens, did not possess, a 3rd party purchased medical insurance policy, then and only then, would market forces be asserted, resulting in an equitable price. Of course, within or under "Market Based Precepts" most families with children will have catastrophic or hospitalization insurance coverage. Under, "Market Based Precepts", practically no one will possess, the now most commonly held, comprehensive-medical-insurance-coverage because this type of coverage does not foster or encourage the application of market forces. Sincerely Yours, David Johnson, 178 County Road 892, Etowah, TN, 37331 ph 423 428 7953. I am 76 years old, spent much time in government employment, in nearly every portion of USA and in many private enterprise jobs. Mr. Dobbs are you and other citizens cognizant of the elephant (Modern-Day-Aristocracy) in the room? The elephant represents the metastasizing cancerous growth of a Modern-Day-Aristocracy in the midst of our central, state and local governments. Hide original message The current political choice is either to return the medical community to sanity "Market-Based-Precepts" or continue muddling through the convoluted contraption of nonsensical bureaucratic idiocy called Obamacare! Most sane folks would proclaim the following, "replace Obamacare with Market-Based medical care precepts common in the USA before LBJ." Medical care was affordable or market controlled in the early 1960's. Why? Because, in the early 60's and previously, nearly every family or individual paid cash for their medical care. Why? There were very few reasons to even consider possessing a medical insurance policy previous to the 1960's, because most every medical procedure and drug was affordable. THE THREE FORMS OF ARISTOCRACY IN AMERICA: (1) THE NOBILITY'S MEDICAL CARE SYSTEM or the most self aggrandizing medical-insurance-coverage available in America since the 1960's. The Nobility's or government employee's (bureaucrat or elected officials) medical-insurance-coverage's is the prerogative of status within America's Aristocratic Society. The Nobility or government employee receives 100% of their wages and benefits from the government's general fund. The Nobility's or government employee's April 15 paper work submitted as taxes paid is, in reality, just a negotiation over their net take home money's. Nothing was or has ever been contributed to the general fund by the Nobility class or government employee, be they city, county, state or federal employee. (2) THE VASSAL'S MEDICAL CARE SYSTEM or the second most self aggrandizing medical-insurance-coverage available in America since the 1960's. Mysteriously, first class medical insurance coverage's are economically affordable or available to employee's of large businesses or corporations (the Vassals). Probably due to scale, size or whose-bread-got-buttered by special deals in Congress (the Nobility), these same loop-holes seemingly are not available to smaller enterprises or individuals (the Subjects). I am quite sure those loop-holes provided to large businesses and corporations and their employees (the Vassals) resulted in inflicting extra and unknown burdens upon the less-politically-connected family businesses and smaller scaled private enterprise employers and their employees (the Subjects). (3) THE SUBJECT'S MEDICAL CARE SYSTEM or those who ended-up-getting-screwed trying to achieve the goal of obtaining affordable healthcare. Who represents the most important and productive portions of the economic society in the USA? It is those hard working Subjects or independent individuals, family businesses, small scale entrepreneurs and their employees. SOLUTION: THE ELIMINATION OF AMERICAN ARISTOCRATIC POLICIES RELATING TO MEDICAL CARE! Return to "Market-Based-Medical-Care-Precepts" as fathomed in our constitutional system of free markets (capitalism). We fought the Revolutionary War to escape aristocratic precepts. For instance, no one should be allowed to obtain medical insurance or medical care from a third party, such as an employer, whether that employer be private enterprise or government. Instead, mandate that everyone possess their own private medical-care-savings-account with 5 % (or ?) taken out of their salary, commission, contract or whatever. There should be, absolutely, no mandate that anyone has any kind of health insurance coverage, nor regulations on who, what, where or the amount of insurance coverage. Nor, should government mandate a single payer or socialized or nationalized medical care systems upon its citizens. The majority of single folks will, by nature, have no medical insurance coverage. The non-insurance-policy-holder is the singular mechanism that could ever re-apply a market force between the provider and the patient in order to actively bargain for the most equitable price. The mere fact, that a majority of working people possess medical insurance coverage, via 3rd party, in 2017, has created a near zero market force, being applied, in the negotiation for an equitable price between provider and patient. If the majority of the citizens, did not possess, a 3rd party purchased medical insurance policy, then and only then, would market forces be asserted, resulting in an equitable price. Of course, within or under "Market Based Precepts" most families with children will have catastrophic or hospitalization insurance coverage. Under, "Market Based Precepts", practically no one will possess, the now most commonly held, comprehensive-medical-insurance-coverage because this type of coverage does not foster or encourage the application of market forces. Sincerely Yours, David Johnson, 178 County Road 892, Etowah, TN, 37331 ph 423 428 7953. I am 76 years old, spent much time in government employment, in nearly every portion of USA and in many private enterprise jobs. Mr. Dobbs are you and other citizens cognizant of the elephant (Modern-Day-Aristocracy) in the room? The elephant represents the metastasizing cancerous growth of a Modern-Day-Aristocracy in the midst of our central, state and local governments. Hide original message The current political choice is either to return the medical community to sanity "Market-Based-Precepts" or continue muddling through the convoluted contraption of nonsensical bureaucratic idiocy called Obamacare! Most sane folks would proclaim the following, "replace Obamacare with Market-Based medical care precepts common in the USA before LBJ." Medical care was affordable or market controlled in the early 1960's. Why? Because, in the early 60's and previously, nearly every family or individual paid cash for their medical care. Why? There were very few reasons to even consider possessing a medical insurance policy previous to the 1960's, because most every medical procedure and drug was affordable. THE THREE FORMS OF ARISTOCRACY IN AMERICA: (1) THE NOBILITY'S MEDICAL CARE SYSTEM or the most self aggrandizing medical-insurance-coverage available in America since the 1960's. The Nobility's or government employee's (bureaucrat or elected officials) medical-insurance-coverage's is the prerogative of status within America's Aristocratic Society. The Nobility or government employee receives 100% of their wages and benefits from the government's general fund. The Nobility's or government employee's April 15 paper work submitted as taxes paid is, in reality, just a negotiation over their net take home money's. Nothing was or has ever been contributed to the general fund by the Nobility class or government employee, be they city, county, state or federal employee. (2) THE VASSAL'S MEDICAL CARE SYSTEM or the second most self aggrandizing medical-insurance-coverage available in America since the 1960's. Mysteriously, first class medical insurance coverage's are economically affordable or available to employee's of large businesses or corporations (the Vassals). Probably due to scale, size or whose-bread-got-buttered by special deals in Congress (the Nobility), these same loop-holes seemingly are not available to smaller enterprises or individuals (the Subjects). I am quite sure those loop-holes provided to large businesses and corporations and their employees (the Vassals) resulted in inflicting extra and unknown burdens upon the less-politically-connected family businesses and smaller scaled private enterprise employers and their employees (the Subjects). (3) THE SUBJECT'S MEDICAL CARE SYSTEM or those who ended-up-getting-screwed trying to achieve the goal of obtaining affordable healthcare. Who represents the most important and productive portions of the economic society in the USA? It is those hard working Subjects or independent individuals, family businesses, small scale entrepreneurs and their employees. SOLUTION: THE ELIMINATION OF AMERICAN ARISTOCRATIC POLICIES RELATING TO MEDICAL CARE! Return to "Market-Based-Medical-Care-Precepts" as fathomed in our constitutional system of free markets (capitalism). We fought the Revolutionary War to escape aristocratic precepts. For instance, no one should be allowed to obtain medical insurance or medical care from a third party, such as an employer, whether that employer be private enterprise or government. Instead, mandate that everyone possess their own private medical-care-savings-account with 5 % (or ?) taken out of their salary, commission, contract or whatever. There should be, absolutely, no mandate that anyone has any kind of health insurance coverage, nor regulations on who, what, where or the amount of insurance coverage. Nor, should government mandate a single payer or socialized or nationalized medical care systems upon its citizens. The majority of single folks will, by nature, have no medical insurance coverage. The non-insurance-policy-holder is the singular mechanism that could ever re-apply a market force between the provider and the patient in order to actively bargain for the most equitable price. The mere fact, that a majority of working people possess medical insurance coverage, via 3rd party, in 2017, has created a near zero market force, being applied, in the negotiation for an equitable price between provider and patient. If the majority of the citizens, did not possess, a 3rd party purchased medical insurance policy, then and only then, would market forces be asserted, resulting in an equitable price. Of course, within or under "Market Based Precepts" most families with children will have catastrophic or hospitalization insurance coverage. Under, "Market Based Precepts", practically no one will possess, the now most commonly held, comprehensive-medical-insurance-coverage because this type of coverage does not foster or encourage the application of market forces. Sincerely Yours, David Johnson, 178 County Road 892, Etowah, TN, 37331 ph 423 428 7953. I am 76 years old, spent much time in government employment, in nearly every portion of USA and in many private enterprise jobs. Mr. Dobbs are you and other citizens cognizant of the elephant (Modern-Day-Aristocracy) in the room? The elephant represents the metastasizing cancerous growth of a Modern-Day-Aristocracy in the midst of our central, state and local governments. Hide original message The current political choice is either to return the medical community to sanity "Market-Based-Precepts" or continue muddling through the convoluted contraption of nonsensical bureaucratic idiocy called Obamacare! Most sane folks would proclaim the following, "replace Obamacare with Market-Based medical care precepts common in the USA before LBJ." Medical care was affordable or market controlled in the early 1960's. Why? Because, in the early 60's and previously, nearly every family or individual paid cash for their medical care. Why? There were very few reasons to even consider possessing a medical insurance policy previous to the 1960's, because most every medical procedure and drug was affordable. THE THREE FORMS OF ARISTOCRACY IN AMERICA: (1) THE NOBILITY'S MEDICAL CARE SYSTEM or the most self aggrandizing medical-insurance-coverage available in America since the 1960's. The Nobility's or government employee's (bureaucrat or elected officials) medical-insurance-coverage's is the prerogative of status within America's Aristocratic Society. The Nobility or government employee receives 100% of their wages and benefits from the government's general fund. The Nobility's or government employee's April 15 paper work submitted as taxes paid is, in reality, just a negotiation over their net take home money's. Nothing was or has ever been contributed to the general fund by the Nobility class or government employee, be they city, county, state or federal employee. (2) THE VASSAL'S MEDICAL CARE SYSTEM or the second most self aggrandizing medical-insurance-coverage available in America since the 1960's. Mysteriously, first class medical insurance coverage's are economically affordable or available to employee's of large businesses or corporations (the Vassals). Probably due to scale, size or whose-bread-got-buttered by special deals in Congress (the Nobility), these same loop-holes seemingly are not available to smaller enterprises or individuals (the Subjects). I am quite sure those loop-holes provided to large businesses and corporations and their employees (the Vassals) resulted in inflicting extra and unknown burdens upon the less-politically-connected family businesses and smaller scaled private enterprise employers and their employees (the Subjects). (3) THE SUBJECT'S MEDICAL CARE SYSTEM or those who ended-up-getting-screwed trying to achieve the goal of obtaining affordable healthcare. Who represents the most important and productive portions of the economic society in the USA? It is those hard working Subjects or independent individuals, family businesses, small scale entrepreneurs and their employees. SOLUTION: THE ELIMINATION OF AMERICAN ARISTOCRATIC POLICIES RELATING TO MEDICAL CARE! Return to "Market-Based-Medical-Care-Precepts" as fathomed in our constitutional system of free markets (capitalism). We fought the Revolutionary War to escape aristocratic precepts. For instance, no one should be allowed to obtain medical insurance or medical care from a third party, such as an employer, whether that employer be private enterprise or government. Instead, mandate that everyone possess their own private medical-care-savings-account with 5 % (or ?) taken out of their salary, commission, contract or whatever. There should be, absolutely, no mandate that anyone has any kind of health insurance coverage, nor regulations on who, what, where or the amount of insurance coverage. Nor, should government mandate a single payer or socialized or nationalized medical care systems upon its citizens. The majority of single folks will, by nature, have no medical insurance coverage. The non-insurance-policy-holder is the singular mechanism that could ever re-apply a market force between the provider and the patient in order to actively bargain for the most equitable price. The mere fact, that a majority of working people possess medical insurance coverage, via 3rd party, in 2017, has created a near zero market force, being applied, in the negotiation for an equitable price between provider and patient. If the majority of the citizens, did not possess, a 3rd party purchased medical insurance policy, then and only then, would market forces be asserted, resulting in an equitable price. Of course, within or under "Market Based Precepts" most families with children will have catastrophic or hospitalization insurance coverage. Under, "Market Based Precepts", practically no one will possess, the now most commonly held, comprehensive-medical-insurance-coverage because this type of coverage does not foster or encourage the application of market forces. Sincerely Yours, David Johnson, 178 County Road 892, Etowah, TN, 37331 ph 423 428 7953. I am 76 years old, spent much time in government employment, in nearly every portion of USA and in many private enterprise jobs. "Idiots" Think just a little! Government employees and elected officials get their healthcare directly from non-government employees or us free enterprise tax payers in America. Government employees just negotiate their net take home from general fund each April 15, nothing was or has ever been contributed to general fund by any government employee in modern times. More commonly called parasites. We the people voted you into office to REPEAL the ACA, not to revamp it!! REPEAL IT NOW!! For those pf you who only vote party lines - GROW UP! It's about the people & the country - not you OR your party. Paul C. from Bel Air, MD signed. Come up with a workable plan & ditch this ACA garbage! Full repeal is the only acceptable solution. Then we can look at a replacement that is market based. Repeal Obama Care. Let the people choose their Health Care Plan. MICHAEL G. T. from Lakewood, CA signed. steve s. from Orange Park, FL signed. Herbert C. from Vallejo, CA signed. What is coming up for a vote is NOT the repeal of Obamacare!!! Vote NO! The federal government has no business meddling in healthcare in any way, shape, or form. David N. from Manistee, MI signed. Alice R. from Mifflinburg, PA signed. Someone from Neola, UT signed. steve j. from Hemphill, TX signed. Republicans get off your tails and repeal obamacare. Toni D. from Charlottesville, VA signed. Jerry T. from Flowery Branch, GA signed. Get a health care system that's not related to Obama care. Do your jobs for the people or get out of politics. Liars have no place representing American citizens. I urge you to repeal and then replace Obamacare as it is truly in the best interests of our great nation! Thank you for your consideration of this matter. Ronald C. from Reno, NV signed. Repeal Obamacare ! Government has no right to force the American people to purchase anything ! Listen to the people you fake republicans. Repeal the WHOLE of Obamacare and give healthcare back to the people. Everything the Gov't touches it messes up or financially drains dry, case in point: Social Security, through U.S. Postal service, the V.A., the Education System. Need I say more? Gov't needs to go back to the job it was designed to do: protect and defend the homeland from all enemies, foreign and domestic. They need to get out of our marriages, healthcare, education and trust that the people are fully capable of running their own lives. In other words, they need to back off and mind their own business. They were NOT elected to run our lives, dig every last dime out of our pockets or think they know how to run our lives better than we do.